I un-shelf along with it each year. that side which did not prevail. Today, a page fell like a memory. of devotion to a cause each held sacred. of Hell’s own sulfur and smoke. couldn’t again slash my nobly scarred nation. that last full measure for nothing. all the people—did perish from the earth. 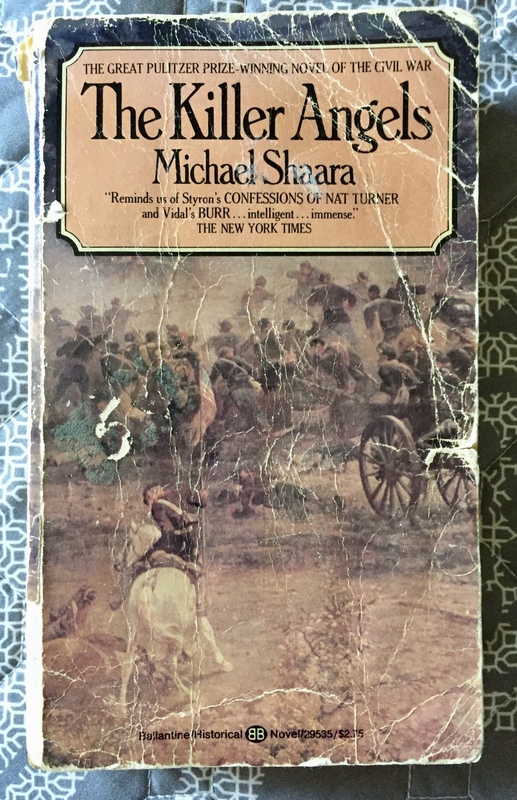 Rambling draft inspired by reading, breathing, feeling, listening to the pages of my old paperback copy of The Killer Angels, Michael Shaara’s fictional narrative of the actual men and events leading up to, within and following the days in July of 1863 we know as the Battle of Gettysburg. I find myself reading more of my Civil War books these days.I love them, but that I feel so viscerally compelled concerns me a little. History repeating itself, as we watch in a kind of horrified awe, stunned by an unwillingness to learn from the past. It is also testament that not enough of we Americans know enough of our own history to see how we are clearly following the same path(s). Witnessing how divided our nation is at this point in time, I could very easily imagine another Civil War taking place. I sincerely hope that we are all wrong and our concerns never manifest to reality. Wondering if all of the blood spilled in any nation’s name ever gets washed away, or is ever worth it. Thought provoking—clearly if we deny, destroy, decimate the ideals people believed they were fighting (and dying) for, we make their sacrifice meaningless. We show the emptiness of nationalistic rhetoric, too. Perhaps there are deep lessons in this historic moment about how our own hubris brought us here. I’m thinking, in particular, of American Exceptionalism, a destructive myth. Brief and to the point, Joe. And all the more powerful for it. Telling in extremis.